Ages 5 through 14. 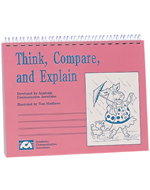 Use the pictures and activities in this kit to help students develop thinking skills as they make comparisons and give explanations. Students are asked to explain events, activities, problems, absurdities, and much, much more. Full color picture cards are include. Compare the Objects. Children are asked to describe how items are the same and how they are different. Compare the Situations. Children are presented with pictures that depict people and objects in a variety of situations. The pictures are similar in many ways, but there are also differences. Students are asked to compare the pictures and to describe how they are similar and how they are different. Explain How. Each picture in this section depicts an activity being performed incorrectly. The child's task is to give a detailed description of the steps involved in completing the activity. Common activities such as talking on the telephone and making a sandwich are included. Explain What's Wrong. Something unusual or impossible is depicted in each picture. The child is asked to explain what is wrong.